Hi, my name is Chloe Ancill. I am 14 years old based in Cambridgeshire. I am a BSJA show jumper primarily with my 2 ponies, Misty and Billie, but enjoy other equestrian activities. I have been riding since I was 6 years old and along the way have had some tricky ponies who taught me to ride! I started showjumping when I was 7 and have gone from jumping cross poles to competing at over a meter. I enjoy particularly making video edits of my successes (and fails!) and asking my followers for their opinions on my riding and other subjects. I am committed to my ponies and disciplines and put a great deal of time and effort into my hobby. I love to win or get placed but equally enjoy having fun. As well as competitive riding, I enjoy hacking out with my mum. In the last year, I’ve done many team events including a 3 day show at Netley Hall. 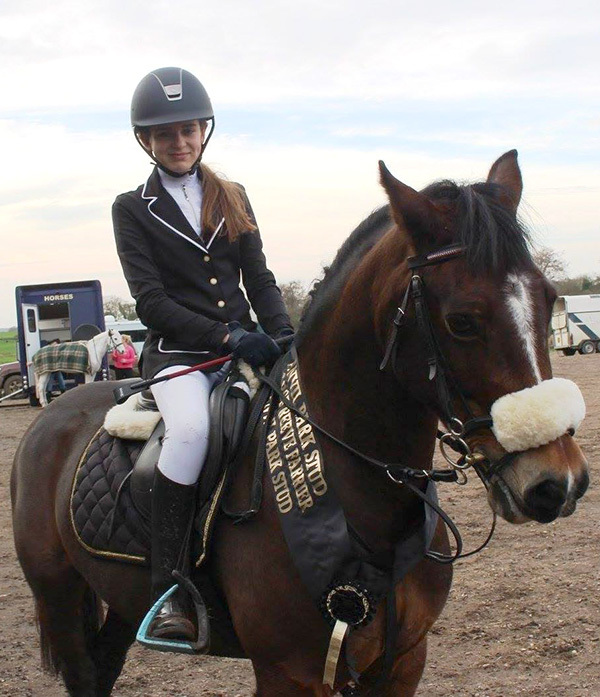 I won the direct qualifier at Arena UK in the 90cm and I was placed in the top 3 in the league for 80 and 90 schools qualifiers which qualified me and my ponies for The British National Championships at 80cm, 90cm and 100cm for Just4Schools. I managed to secure 7th place in a massive and competitive class. Next year, I hope to qualify the JA sparkle qualifier for Bluechip on Billie and Coral on Misty. As a long-term goal, I hope to compete at HOYS, whether it would be showjumping or working hunter. I went last year to watch with my mum and I absolutely loved it!